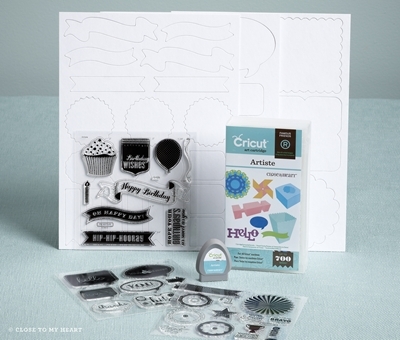 Creating with Christine: Cricut Artiste: One Size Fits All! I LOVE how this new cartridge is designed!! The cut size is actually the finished size! For example, if I want a 4" card, I set my cut size to 4" - my cricut will cut the card at whatever dimensions it needs to be so that it will be a 4" card when folded. Same with the coordinating envelope. I set the cut size to 4" and it will cut the envelope slightly larger to fit my 4" card! Want a 2" gift box? Set the cut size to 2" and so on....Isn't that brilliant? I love it!! Click HERE to watch this short video to learn more. If you still don't have your Artiste Collection yet, click here to grab it today so you too can create fabulous projects with ease! Be sure to join my Open House Giveaway for your chance to win prizes too!